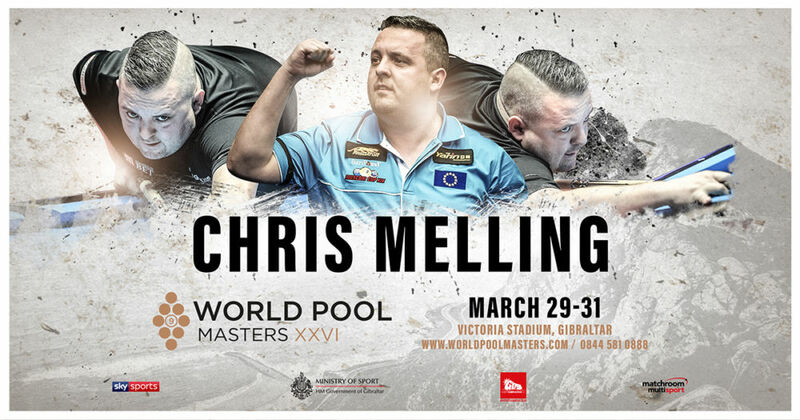 Chris Melling will join the line-up for the 2019 World Pool Masters in Gibraltar after winning the Fans’ Choice vote for the 24th and final place in the event. England’s Melling, who won the 2018 Derby City 9-Ball and is a former Mosconi Cup MVP, took 29.29% of the final vote to join the superstar field which also includes the likes of defending champion Niels Feijen, world champion Joshua Filler and two-time Masters winner Shane van Boening. The new-look World Pool Masters will see 24 of the world’s best players set to battle it out for their share of a $100,000 prize fund with the winner in line to take home $25,000.For the first time there are now eight pre-determined spots in the World Pool Masters, with a further 15 players invited by tournament promoter Matchroom Multi Sport. Melling took the final spot after being selected by you, the fans. The draw for the World Pool Masters will take place on Friday, February 15 and will be shown on World Pool Masters social media pages.